Arrive Cancun > Drive Tulum 7 Nights > Drive Cancun & Leave. Upon arrival in Cancun Airport you will be escorted by your private driver to your luxurious sanctuary, Cenote del Mar, in Tankah Bay, just 15 minutes outside of Tulum. This 8600 sq. ft private villa in the Riviera Maya is one of the most luxurious with spacious rooms, a private pool, and a rooftop terrace with incredible panoramic views of the entire bay. At night, enjoy a complimentary welcome dinner prepared by the villa’s private staff. Overnight stay at Cenote del Mar. After waking up to a wonderfully prepared breakfast and fresh fruit juices, the day is yours to enjoy at your leisure in your luxury villa. Options including lounging at the swimming pool, taking out the house kayaks to discover the bay, snorkeling with the tropical fish, or enjoying a outdoor BBQ. Your private chef will help set a menu for your stay, and help choose the groceries you need including kosher, gluten-free, vegetarian, and other dietary needs. You will be met in your villa bright and early for a privately guided trip to Tulum. Accompanied by your expert guide you will visit the sites of most interest at Tulum including El Castillo, the Temple of the Frescoes, and the Temple of the Descending God. You will also visit the Sian Ka’an Natural Biosphere Reserve and travel by boat through various habitats learning about ecosystems, tropical birds, and plants. Your naturalist guides will show you the freshwater inland trade routes used by the Mayans over 1200 years ago. You will see abundant flora and fauna unique to the Sian Ka’an habitats and eco-systems, and an unexcavated Mayan ruin. Today you will be whisked away to some of the Riviera Maya’s most alluring sites: Coba and Akumal. The impressive structures at the archaeological site of Coba speak to the grandeur of the civilization that produced them ages ago. Interestingly, today very little is known about this important Mayan city but your expert guide will discuss the different theories that seek to explain the different temples, ball courts, structures and other salient features. In Akumal, you will enjoy a close encounter with the mythical, graceful, and endangered sea turtles of this enchanting coast. Today is another day for you to enjoy the villa in the middle of paradise. The Tankah Bay offers a range of activities to enjoy including scuba diving, fishing, golf, and shopping. At night, nearby Tulum and Playa del Carmen offers outstanding nightlife, restaurants, dancing, music, and more. After a delicious brekfast masterfully prepared by the in-house villa chef, you will be met for a privately guided full day trip to Chichen Itza, one of the Seven Wonders of the World. 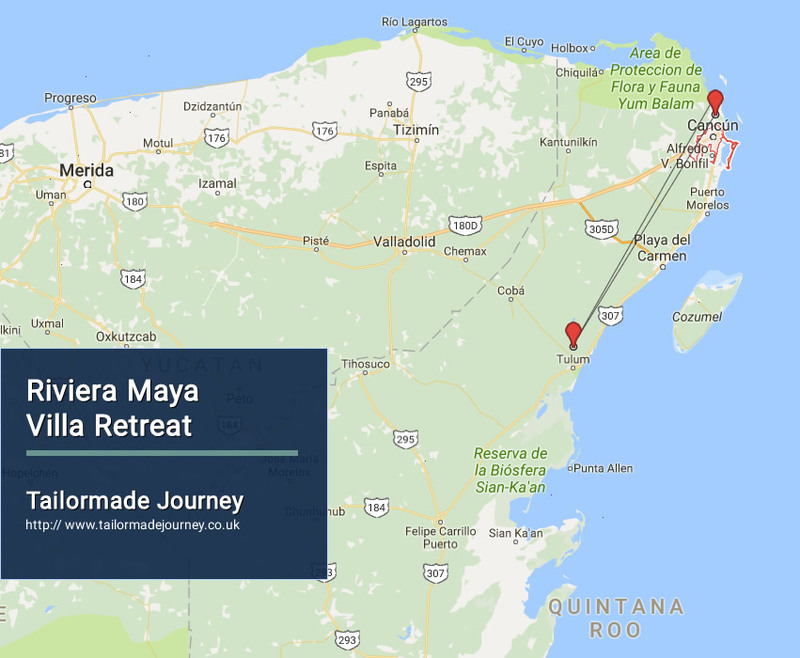 Accompanied by your expert guide you will visit the sites of most interest including: the ball court, the Temple of the Warriors, the Sacred Cenote, The Wall of Skulls, and the Kukulkan Pyramid. After, you will get to cool off in the fresh waters of the “Sacred Blue Cenote” located in the Ikkil Park. Enjoy one last day at your complete leisure at Cenote del Mar, private villa. Today you are transferred to Cancun Airport to board flight for Onward Journey .